How long will the clock continue to tick? Has the 24: Legacy TV show been cancelled or renewed for a second season on FOX? The television vulture is watching for the latest cancellation and renewal news, so this page is the place to track the status of 24: Legacy season two. Bookmark it, or subscribe for the latest updates. Remember, the television vulture is watching your shows. Are you? Airing on the FOX television network, 24: Legacy, is yet another race against the clock to stop a devastating terrorist attack on U.S. soil. Six months prior, in Yemen, Sergeant Eric Carter (Corey Hawkins) and his elite squad of US Army Rangers killed terrorist leader Sheik Ibrahim Bin-Khalid. After the sheik’s followers declared a fatwah, the squad and their families entered the federal witness protection program. A new attempt on Carter’s life makes it clear that his team is now exposed. He enlists Rebecca Ingram (Miranda Otto), a brilliant and ambitious intelligence officer who has stepped down from her post as National Director of CTU. She’s supporting her husband, Senator John Donovan (Jimmy Smits), in his campaign for President of the United States. The rest of the cast includes Teddy Sears, Dan Bucatinsky, Anna Diop, Ashley Thomas, Charlie Hofheimer, Coral Peña, Gerald McRaney, Raphael Acloque, and Sheila Vand. The first season of 24: Legacy averaged a 1.40 rating in the 18-49 demographic with 5.12 million viewers. Find out how 24: Legacy stacks up against the other FOX TV shows. On May 15, 2017, 24: Legacy was not renewed but FOX may be open to a second season. Stay tuned for further updates. 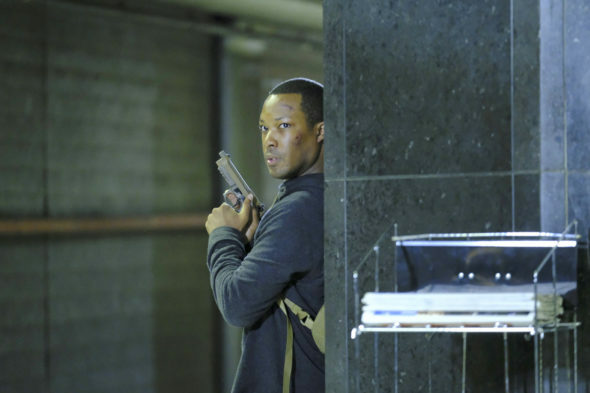 24: Legacy premiered over two nights, with the first hour airing directly after Super Bowl LI. This greatly skewed the ratings upwards. Plenty of people just kept watching FOX after the game and the ensuing post-game coverage, or didn’t bother turning off the TV. The second hour, which aired the following night, dropped off sharply, and earned much lower (although still respectable) numbers. Later ratings have been a different story. FOX is truly behind this 24 sequel series but the numbers do not bode well. FOX may renew 24: Legacy for a second season but, based on the ratings, they probably shouldn’t. 5/15 update: 24: Legacy was not renewed by FOX. There will be no season two, for now but it “could” happen in the future. Details here. TV show ratings are still important. Follow 24: Legacy’s weekly ups and downs. Find more 24: Legacy TV series news or other FOX TV show news. What do you think? Were you hoping that FOX would cancel or renew 24: Legacy for a second season? Does this new TV series have staying power? More about: 24: Legacy, 24: Legacy: canceled or renewed?, 24: Legacy: ratings, FOX TV shows: canceled or renewed? season 2 of 24 should be renewed. i thought the show was great. My family and I looked forward to 24 every week. There are many shows that could be cancelled bit this is NOT the show to cancelled. Bring it back. My family absolutely loved it! So disappointed its not coming back! What is wrong with Fox? Times have changed. Tons of people have watched the show during a binge, after the season finale, and learned to love it. It deserved at least one more season as it was just picking up momentum and gaining a broader audience. There’s no way I would have quit so easily — it would have made it. 24 legacy the story line for the series is phenomenal. I am looking foward to season 2. 24 legacy and shots fired. They are favorite. You should have renewed it and did for the 24 episodes like you did previous season, maybe you would have kept your star. Please keep, really enjoy watching!!!! This is a good show!!!! LOVE IT!!! 24 is one of the BEST shows ever! I have been a 24 fan from day one! Even though Jack isn’t in this one it was still great! And yes, Chole does needs to come back! It was great seeing Tony and hope he continues to be in the show! So Please bring back 24 Legacy!! Love the show. I hope Fox reconsider’s it’s decision and bring it back for another season.